Packers Add Two on Defense ~ The Bucky Channel - The World of Sports from Wisconsin's Perspective. We touched on it after day one of the draft, but it's starting to seem like there is a definite pattern to Ted Thompson's draft style. In the first round, he'll likely take the guy that seems like the obvious choice, and there's nothing wrong with that (we're excluding Justin Harrell here). But get him to the second round, and Ted quickly shoots off the board to take someone we've never heard of. This year, that someone would be Mike Neal. Everything I've read so far about Neal actually does have good things to say about the defensive tackle Purdue, expect for one glaring trait. Apparently, Neal is a guy that is often referred to as inconsistent, someone who routinely takes plays off, and for the most part is out of shape. Regardless, I don't think Ted takes a guy that like this high if he knows that they can't change some of those bad habits. Still, I don't mind the pick here. It looks like Neal is a guy that plays very powerful and is quite quick for his size, and will be included in our upfront rotation as a defensive end. The Packers defensive line coach Mike Trgovac had a few other things to say about him, you can check that out at JSOnline.com. After the Neal selection, the Packers were scheduled to have one more pick on Friday night, one they ended up selecting 15 picks earlier than they were supposed to. 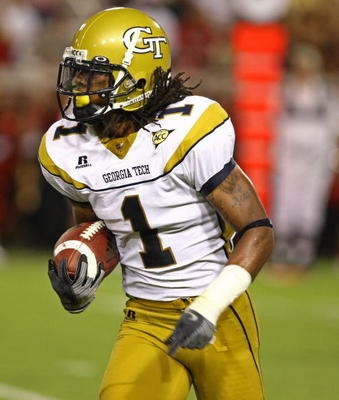 With that selection, the Packers selected Georgia Tech safety Morgan Burnett, and I think this was another strong selection as well. Scouts were split on this guy also, but you'll pretty much have that for anyone drafted in the second and third round. The good things about this guy is that he has the tool set of a first-round safety, he has great cover ability, and some scouts even call him an "enigma". Of course, I got all that information from JSOnline.com as well, so let's give Greg A. Bedard some more love and check out his interview with Burnett. By trading up, the Packers will have round four off before they pick again in the fifth round. I've been pretty happy with the draft so far as a whole. Nothing too flashy, and I'm not sure that any of these picks will even end up starting by the end of the year. But the Packers are getting depth at the positions they need it most, and I'm very happy about that. I would like to see them round this out with some more depth on the defensive side, especially cornerback, and then top it off with a late round quarterback or running back.